Every Sunday evening when she was in college, Vicki Ganniger took a roll of quarters to a pay phone and called home. Now, Ganniger keeps in touch with her daughter, Katie, a freshman at Columbia College, far more frequently on their cellphones. “I love texting Katie — not that she always answers,” the St. Louis mother said. Smartphone apps have changed how parents connect with their kids who are at college. The majority of moms and dads of today’s U.S. college students use multiple platforms to communicate. A 2016 Pew Research Center study on demographics of mobile devices showed 88 percent of adults ages 30 to 49 and 74 percent of adults ages 50 to 64 own smartphones. The same study said 92 percent of adults ages 18 to 29 have them. Jacob Moscovitch and his mother use the messaging platform WhatsApp to stay in touch. With the 2010 introduction of FaceTime and other video calling apps, contact with family back at home became even easier. “Especially when Jacob has time, we do a lot of FaceTime,” Ester Moscovitch said. Vicki Ganniger doesn’t own an iPhone, so she uses her husband’s to FaceTime Katie Ganniger. “We FaceTime sometimes, but I think she FaceTimes her sister more,” Vicki Ganniger said. Another Pew study, a 2016 look at the demographics of social media use, found Facebook was the most popular social media platform for adults of all ages. It is used by 88 percent of adults 18 to 29, 79 percent of adults 30 to 49 and 61 percent of adults 50 to 64. The study also looked at Instagram, Twitter, Pinterest and LinkedIn. Maria Butauski, a doctoral student in the MU Department of Communication, worked on a study led by Jeffrey Child, an associate professor at Kent State University who researches communication technologies and human interaction. Published in 2015 in the Journal of Family Communication, the study looked at how college-aged students share private information online and offline with their siblings, parents and grandparents. “We found that not only are parents and children Facebook friends and communicating with each other on Facebook, they are doing a lot of offline communication about what they are doing on Facebook,” Butauski said. According to the study, families who were comfortable sharing more information with each other on Facebook talked more frequently in person about what they saw on each other’s Facebook profiles. “We are seeing that Facebook is actually a mechanism for a lot of family ties to be maintained,” Butauski said. Vicki Ganniger occasionally comments and likes her daughter’s Facebook posts. Katie Ganniger said her mother once made the comment, “focus on school not boys,” on a picture of her and a friend. Claire Steward, a second-year veterinary medical student at MU, and her family members have a private Facebook page. Occasionally, even her grandmother posts there. 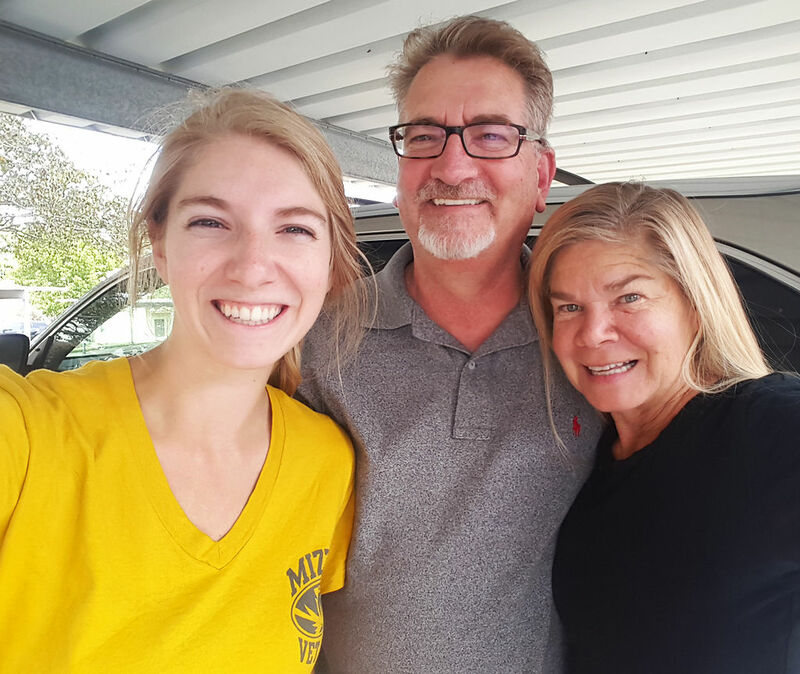 Steward’s parents also keep in touch with her via Snapchat, a popular photo messaging app. According to research firm MoffettNathanson’s 2016 report, 35 percent of Americans use Snapchat. At the end of 2016, 70 percent of Snapchat users were ages 18 to 24, while just 23 percent were people older than 35, up from 8 percent at the beginning of that year. Jacob Moscovitch once posted a video of himself walking toward the edge of a cliff at Capen Park on his Snapchat “story.” He said his mother instantly reacted by text.